I love busy bags. I’ve been using them off and on for nearly three years. 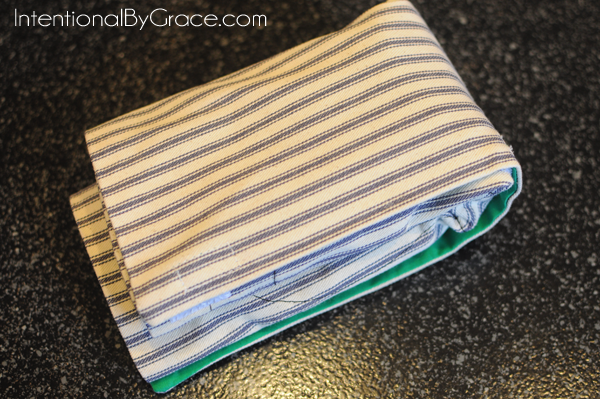 Most often I use busy bags with my children when they are in the 12-24 month old range (here are 7 of our favorite), and then switch over to toddler trays or busy boxes after that. 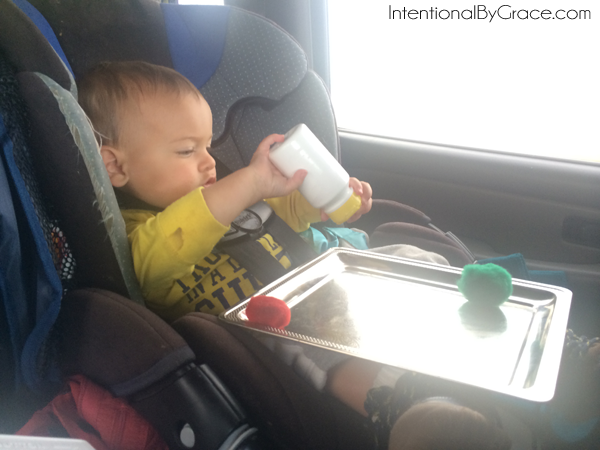 However, busy bags are perfect for traveling with little ones, and the following busy bags accompanied us on our month long road trip. 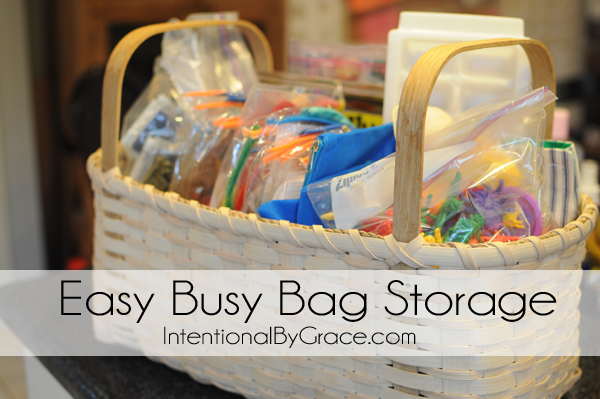 But all of these busy bags are great for home too! 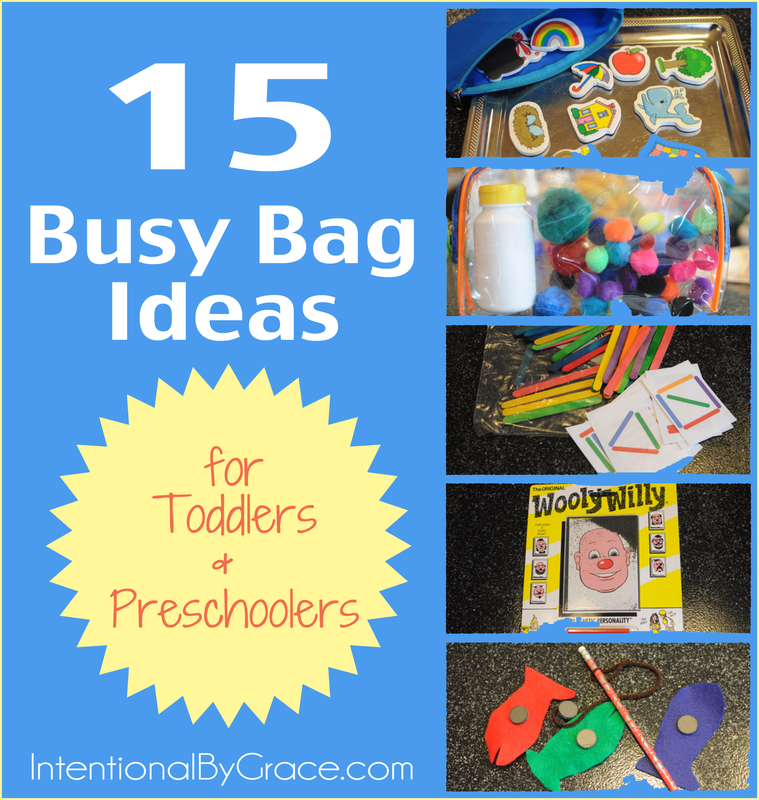 I love these busy bags because they are so versatile, and they work well for my 13 month old and 3.5 year old. We don’t always use the bags as they were intended, but that’s what makes them BUSY bags. I love seeing my boys get creative and busy themselves with things that ignite their imagination. 1. Bugs Keep Us Busy – This one is from our busy bugs set. 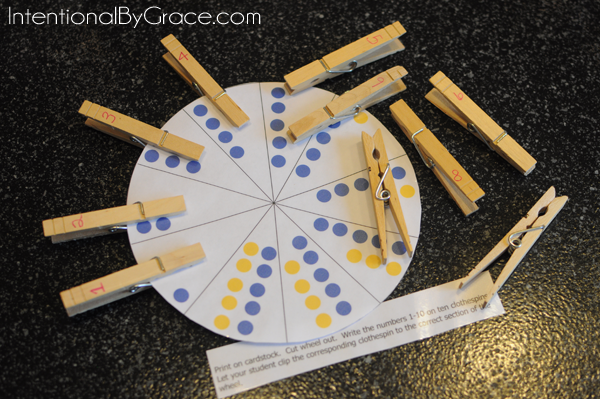 This is great for learning patterns, color matching, counting, and free play. What kid doesn’t love playing with bugs, right? 2. Which Way Did He Go? 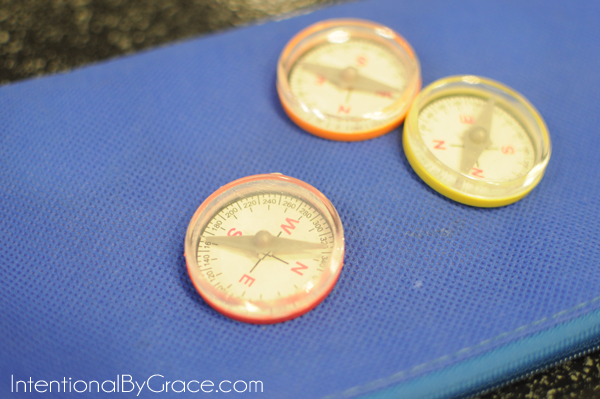 – Since we were traveling, I put a few compasses I snagged from the dollar store into a bag. My oldest enjoyed telling us which way to go, talking about the letters, and just watching the dial spin as we turned through the city. 3. 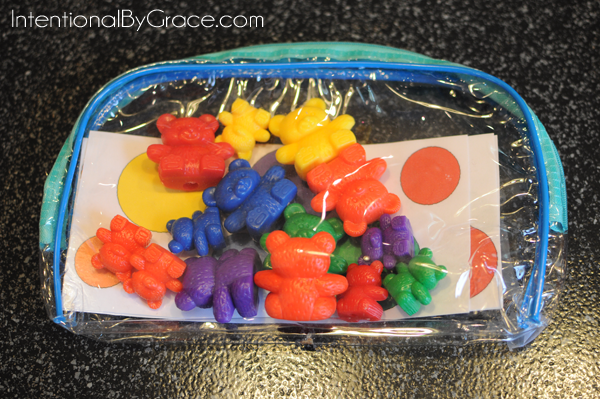 Color Match Bears – I got my color printable here. Matching bears to their colors (and choosing the right size) was a great rainy day activity. 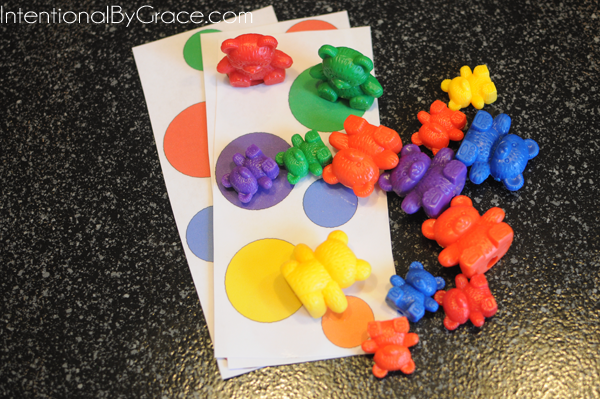 You can match the bears to the colors, sort according to size, practice patterns, one-to-one correspondence, and so many other ideas. We love our counting bears! 4. G.I. 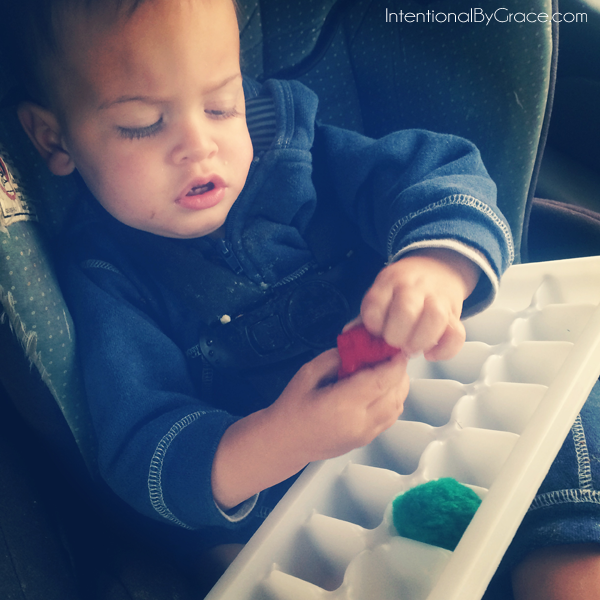 Joes – A simple idea for keeping imaginative children occupied. Both of my boys loved these, especially when we visited Civil War Memorials. 5. Gone Fishing – This one is simple to make and fun to play with! 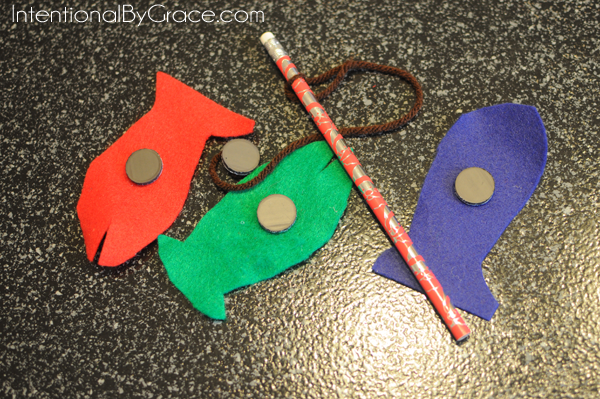 I just added a magnet to felt “fish,” tied a string around a pencil and hot glued the string to a magnet. 6. Number Wheel – I got this one from here. It’s simple to put together and great number practice. 7. Pipe Cleaner Shapes – I got the idea for this one here. 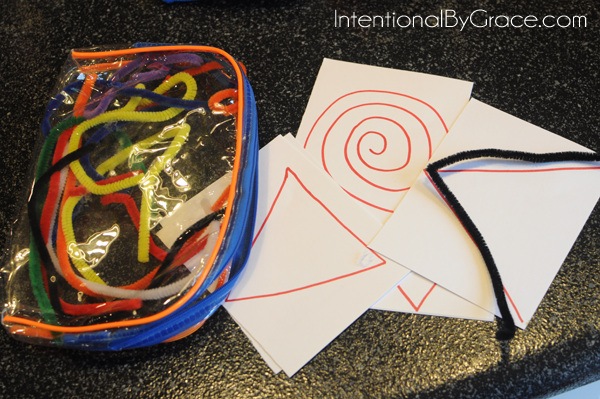 I just drew shapes on card stock and threw some pipe cleaners in the bag. 8. 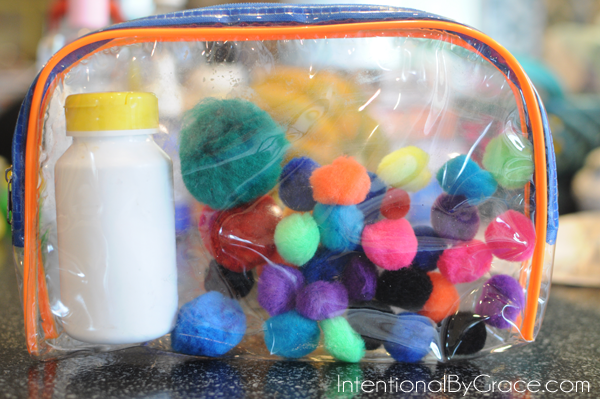 Pom-Poms and an Empty Bottle – This busy bag was the most used busy bag we took with us! My youngest loved stuffing the pom-poms into the empty bottle. He also loved when I gave him an empty ice cube tray. I would just give him two large pom-poms and it would keep him busy for a while. I was amazed! 9. 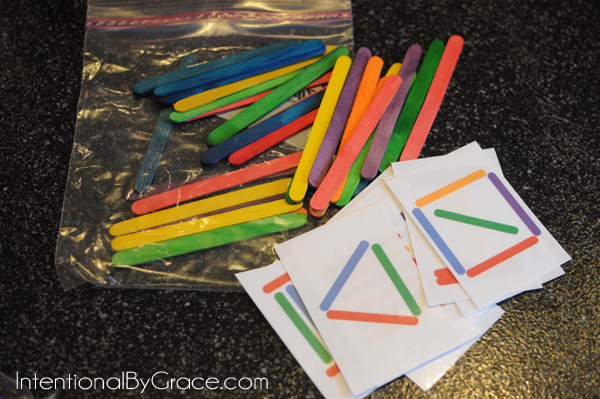 Popsicle Stick Patterns – I got my patterns here. 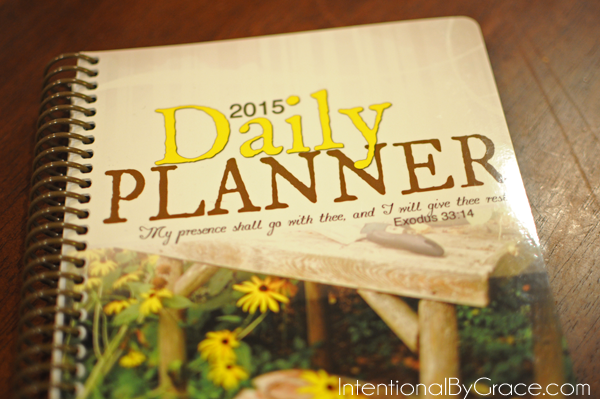 We love these and use them all the time, not just on the road. 10. 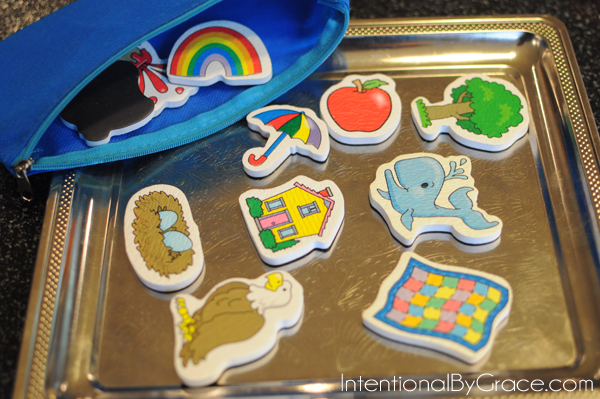 Story Magnets – I put several foam magnets in a bag and provided a tin tray I got from the dollar store. My oldest uses the magnets to tell stories, and my youngest just likes to take them on and off. 11. 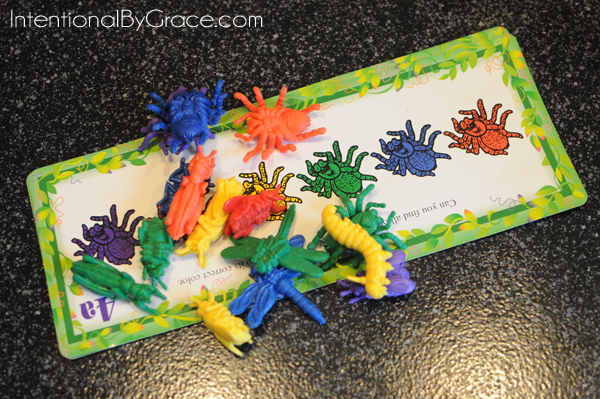 Textured Animals – Another snag from the dollar store. 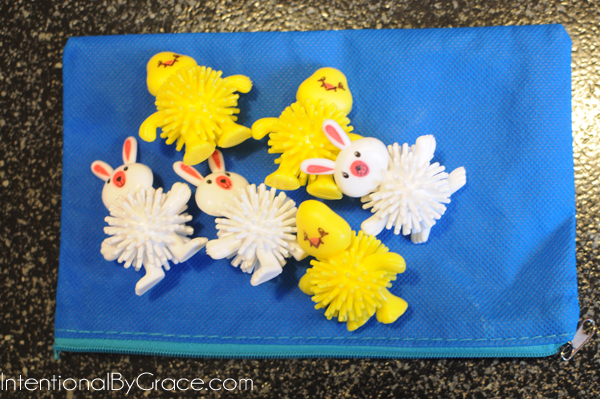 The bunnies and ducks like to come out in the spring, but they also make great busy bags. The texture occupies my youngest, and my oldest loves playing pretend. 12. 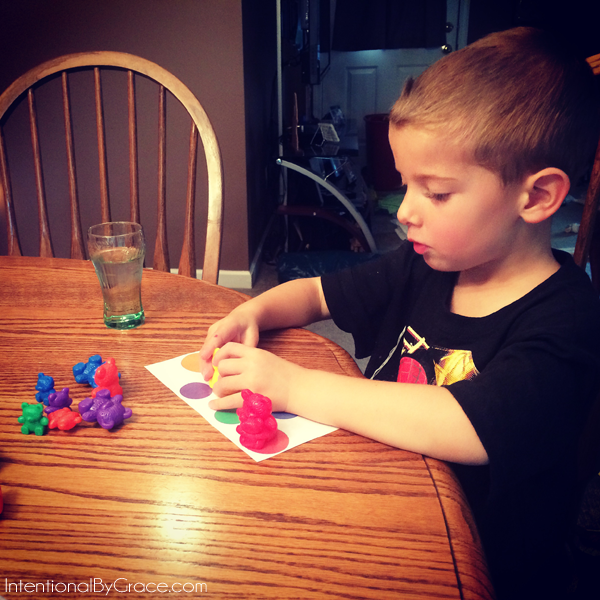 Wooden Color Matching – This is great fine motor practice as well as color matching. I made these myself from materials I found at JoAnn’s. Most any craft store will have them. I just painted them the colors I wanted to have. We’ve been using this busy bag for years. 13. 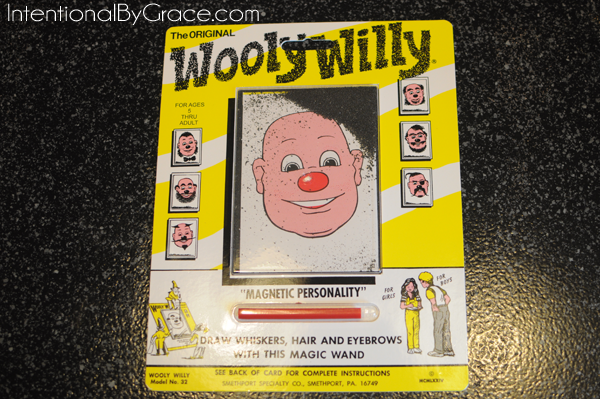 Wooly Willy – I loved Wooly Willy as a kid. I remember my parents bringing him along on car rides for me to play with, so I knew I had to get one of these for my oldest. It took a few minutes to figure it out, but once he did, he was hooked! 14. 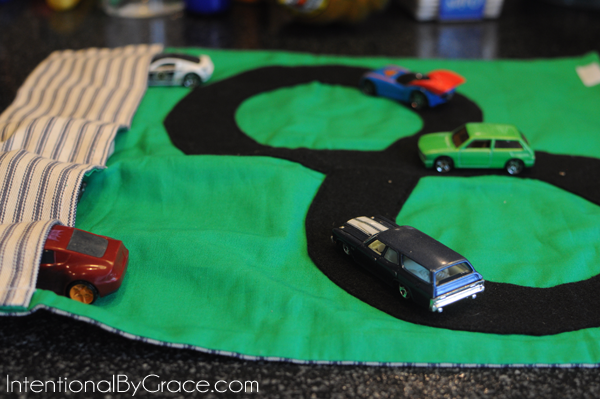 Cars to Go – My mother-in-love is handy with a sewing machine. I have one and I can’t wait to learn to use it. But in the meantime, she does all our sewing projects. She made this cute car track for my oldest because he loves cars so much! It folded up nicely and fit right in a bag. He loves it! We got the idea from here. 15. Landmark Cards – Since we were going to be seeing a lot of sites along the way, I made landmark cards of all the major places we would be visiting. I just searched online for an image, printed it on card stock, laminated them, and hole punched them together. This is great for geography lessons too! Another talent of my mother-in-love is that she’s a mean basket weaver. She made this basket for us a few years ago, and it’s the perfect size and shape to store all of our busy bags. I keep all my busy bags together in this basket in the floor board of our car. It sits on the shelf when we’re at home. Ahhhh, so organized … makes me happy. I love these plastic bags by the way. I got them in the bath section at the dollar store a few years ago and bought every single one they had. 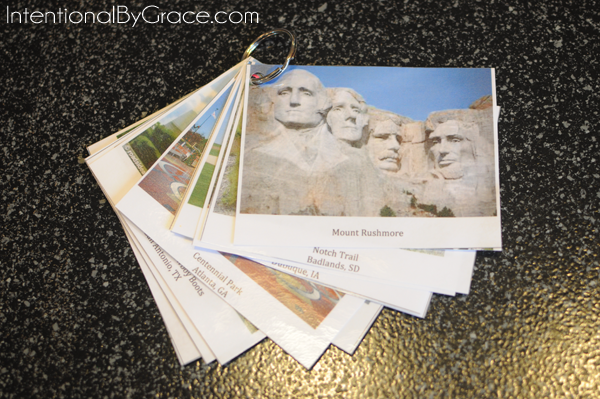 It came with the small cloth bags you saw pictured above with the compasses. The clear plastic ones have been PERFECT for busy bags! I like that I can see what’s inside and they zip. It just feels so much more secure, and they last much longer than a simple plastic zip top bag. 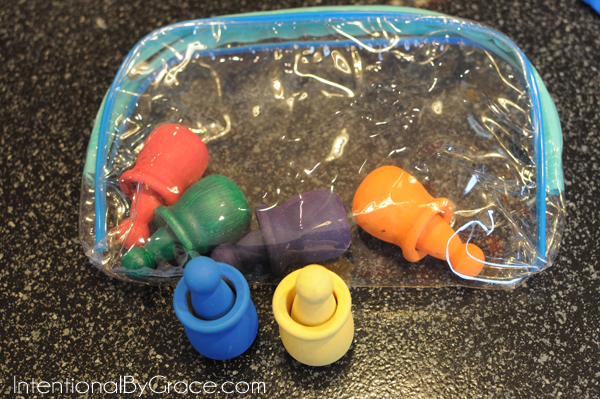 Busy bags are so easy to make. 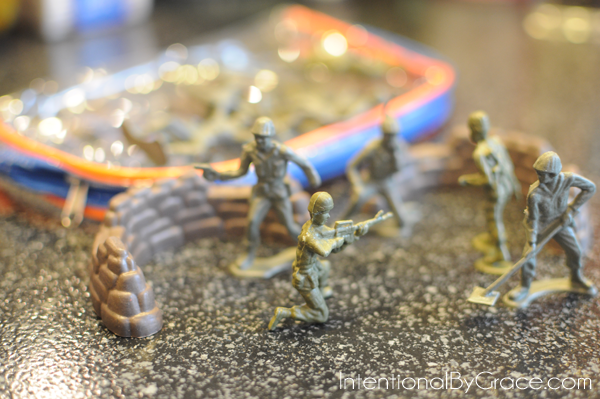 They don’t have to be complicated, and they can simply be small toys set aside for special play time (like the G.I. Joes for example). 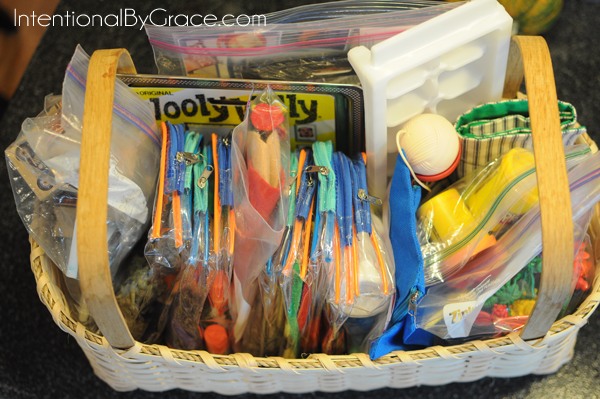 Do you need more ideas for creating busy bags? Check out my Busy Bag Pinterest Board. 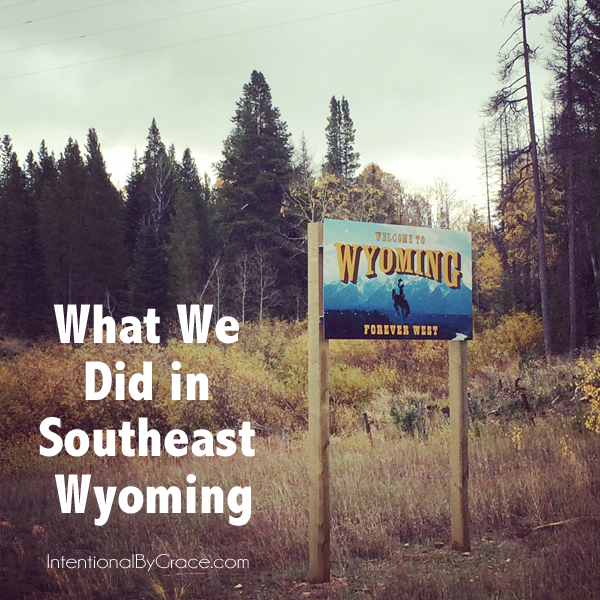 I’m constantly pinning new ideas there! We love busy bags!! We have a set we keep in the car specifically for church. Our little man stays with us while we are at church, a few of the smaller children do, and these keep him quiet while my husband and I listen to the pastor. The other set is used when we are doing preschool homeschooling for his big sister and he isn’t quite able to “learn” along with her.